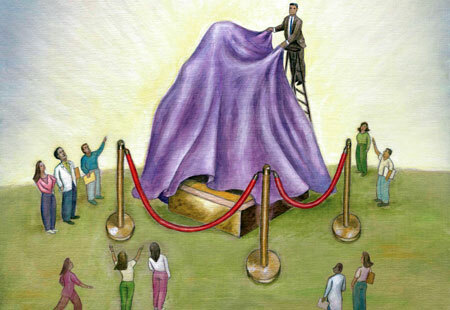 What is unveiled at an unveiling? My brother Dave, my husband Chas, my two young adult children Hillary and Eli, and I stand at Mom’s grave. We cover Mom’s headstone with a purple cloth, purple with bright blue labyrinths. Four odd-shaped stones from Mom’s garden hold it firm against the breeze. Psalm 23. As I speak one set of words, we hear another. God brings me to graze in green meadows. In these mowed grasses and manicured cemetery hedges, we will be nourished. You lay before me a table against my troubles. You, Mom, you set the table with courage and love. Surely goodness and love shall follow me. Your traits, Mom. Your goodness, your love. Unveiled: a million meanings of Psalm 23’s green meadows and still waters. And of tears. Unveiled: Respect. For parents, for the deep truth of myth. And for tears. Brother Dave, do you have any words? The children shake their heads faintly. No words for them, just tears. Unveiled: the pure essence of what has changed. Mom’s presence. Missing. Hillary and Eli uncover the stone. El Maley Rachamim. I translate, loosely, but not inaccurately: When you look at the night sky, and see a bright star, you know that Mom, Grandma, is shining on you and guiding you. Unveiled: Mom’s presence. With us every day. Through our tears. Unveiled: the power of a few simple words to hold lifetimes of meaning. Shlomo Carlebach’s Return Again: Return to who you are, return to what you are, return to where you are, born and reborn again. Mom, if you have any doubt whether you have been reborn, look at us. Unveiled: mysteries of generation. And mysteries of tears. We hold hands in a semicircular chain and cry. We move to Dad’s grave. “People are dealt different hands in life,” my brother says,”but when it comes to parents, I was dealt four aces.” We leave stones. We move to Freddie’s grave. “We didn’t really know him,” I say, “but we are sure he would have grown up into a great brother. What else could he be, in this family?” We leave a stone. We show the grandchildren the graves of our own grandparents. We walk to the graves of Aunt Sylvia and Uncle Max. We leave a really big stone. Unveiled: the gift of a good family. Precious, priceless, pure. Grounding us in reality. I am honored to have been invited to your moms unveiling. It’s been a long growing year for you all. Thanks, Anne, for this beautiful comment. Thanks, Dana, for the very sweet note! Shana tova u’metuka. I sent this on to my husband Ross, Laura. His yartzeit for his sister was last week. Erev Rosh Hashana is his yartzeit for his mom and Erev Sukkot for his dad. This is his time of year… And I think the post will be sweet for him, so thanks. Thanks, Hannah! I hope it makes him feel close to his beloved family. You have left me awestruck, again. Thank you for sharing. You’ve touched my soul.